Tag Archives for " Rick Enrico "
Businesses, or marketers to be more specific, can benefit from social media automation. With billions of people using Facebook, Instagram and other online channels at present, social media automation applications—or what marketers call as “gadgets from above”—can save precious time and money while also enhancing business strategies. By commanding a system to do multiple functions at the same time, marketers are able to maximize their tasks, increasing one’s productivity and work efficiency. However, when done the wrong way, social media automation can cost you more than what you have gained. If an automated platform, for example, sends pre-made responses to the wrong customers, it may be seen as an act of insincerity and neglect, which can damage a brand’s good reputation. The contribution of social media automation is essential for business. Personalized responses, targeted messaging, and/or being first in the lead are beneficial offers that can make a difference in business processes. But marketers should be cautious. Just because social media automation guarantees convenience and sales conversions, it doesn’t mean that one should automate their entire marketing system. Inappropriate responses, accidental spamming, and responding to customers with their pet peeves can lead to a quick online backslash. It doesn’t have to be this way, especially if you can take control. What should you do to avoid such mishaps? Learn how social media automation works and when it’s ideal to use. Social media automation apps make daily work processes relatively easier and faster. What marketers usually do in an hour or two can be accomplished in just a few minutes. Compared to manual operation, such applications are more cost-effective; some doesn’t even need close supervision. Marketers, even the most dedicated ones, can sleep while their apps work for them over time. These applications can communicate through systems—without manual operation but useless time—making them necessary for a business and its various departments. We know that unlike humans, social media automation apps are not capable of formulating genuine responses. They only answer according to what have been programmed, resulting in responses that do not and cannot suit every customer inquiry. Arguably, this is a problem often overlooked by businesses. Leaving customer satisfaction to auto-response systems may only upset consumers. With today’s demands and swift innovation, customers tend to dislike canned responses, especially those that delay real reports and/or solutions. Marketers should avoid this. There is nothing better than providing a personal response that will make customers feel regarded and special. Responding to your customers with their pet peeves is the last thing you would want; you’re only lucky if they’re sport enough to make jokes out of them. There are specific solutions that cater differently to different social media issues. There are times when it’s okay to automate your posts and responses, and there are also times that it’s not. When choosing between manual and automated, think about each feature’s capabilities, limitations, and most of all, the satisfaction it can provide to customers. Let’s break it more specifically below. Automated You Say? If you wish to provide a more genuine response to customers—answers that specifically cater to their needs and your company’s branding—then automation is not for you. Remember that social media automation apps can only generate the same answer—those you have provided for its system. By sending templated responses that do not suit their queries, you put them in a common place, which can make them feel insignificant. Keep automation apps away from comments and messaging sections. Don’t let bots do all the talking. Any form of speech should be provided by a representative who knows the company well. Doing It Manually. Here comes the positive side of this feature. Social media automation is great when assisting tasks such as looking for content suggestions, auto-publishing and searching for brand mentions. It plays a huge part in a company’s productivity by reducing the time and energy that a marketer pours into work. Keep in mind that social media automation apps should enhance your productivity not judge and understand customer reactions. Let them click buttons, let them bring you options, and let them show you what has been discovered—but never let them answer what they cannot. Social media automation maximizes three major aspects of productivity: energy, time, and resources. Posting and monitoring have never been easier until social media automation came into being. There are many functions social media automation provides, but not all of them are right for your business. Know what applications to use—and how you can use them properly—for your business. You’ll see your marketing efforts skyrocket in no time. Rick Enrico is the CEO and Founder of SlideGenius, a presentation design agency from San Diego, California. He regularly publishes expert presentation tips on the SlideGenius Blog. You can connect with him on LinkedIn and Twitter. 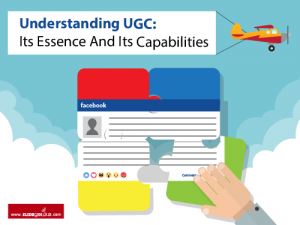 In today’s digital age of marketing, brands are focusing on User-Generated Content (UGC) campaigns to improve their web performance and increase organic responses. User-Generated Content refers to any form of online content such as a Tweet, Snap, Facebook status, Instagram post, or blog that contain authentic opinions about a service or product as experienced by a non-professional. Fairly, their choice of marketing strategy is justifiable with all these successful user-generated content campaigns trending in various social media platforms. Whether you’re a startup business building an audience or an existing brand struggling to establish a solid base of loyal customers, developing a marketing strategy that heavily emphasizes user-generated content will benefit your product one way or another. Before exploring the internet labyrinth and its mysteries, the first thing you should do as an adaptive marketer is to fully comprehend the value of user-generated content at its very core. If you need any presentation assistance for your brand, there are two things you should consider: a well-planned social marketing strategy backed by a structured social content approach, and a broad knowledge of internet copyrights. 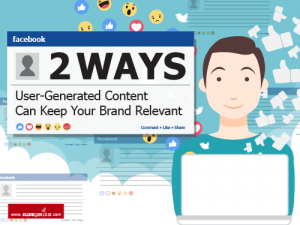 You need to know that user-generated content can build or destroy your brand’s reputation. A recent study shows that user-generated content is in demand – being produced and recommended to social circles at a rapidly increasing rate, especially among the younger generation. As the reach of online platforms has expanded throughout Web 2.0, consumers have been given the freedom to express themselves in a span of seconds. People can post good and bad things about your brand, the quality of your service, and the performance of your product in a short amount of time. However, the most crucial part for any post apart from its authenticity is if the customer will end it with a call to action that recommends you. 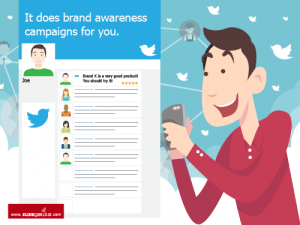 It does brand awareness campaigns for you. User-generated content is pervasively dominating social media as if it were an epidemic outbreak, which is good. The Nielsen Company conducted a worldwide survey and found that consumers trust word of mouth marketing the most; 90 percent of survey-takers believe recommendations from people they know while 70% put faith in reviews posted by strangers online. Even millennials are said to be obsessed with user-generated content. All these statistics have one common ground: authentic feedback. Buyers are more likely to get hooked on a brand due to real and trustworthy experiences provided by other users. A good example is Starbucks’ successful design-a-cup campaign in 2014. The campaign encouraged U.S. and Canada-based customers to design their own Starbucks cup, take a photo of it, and post it online with the hashtag #WhiteCupContest. The winner receives the privilege of having his masterpiece as the official design of Starbucks’s limited edition reusable cup. In four weeks, the campaign received 4,000 entries. Yes, it wasn’t a 5-digit figure but think about it – with each entry, dozens of friends and family members rooted for their participant and constantly shared it through online posts. Another example would be Marc Jacobs’ #CastMeMarc stunt in which participants posted their best modelling photos/selfies on Twitter and Instagram under said hashtag. Winners were scouted by the company for its 2014 advertising campaign. Within a day, Marc Jacobs received more than 15,000 submissions. Again, each entry had its corresponding supporters based on the participant’s number of followers; each post was linked with a number of likes generated by the connections of the aspiring winner. 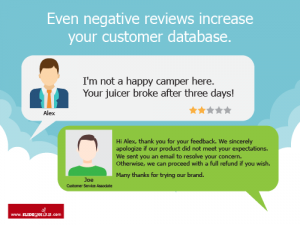 Even negative reviews increase your customer database. Focusing the spotlight on customer reviews makes your brand more authentic. To make your brand more credible in the eyes of your customers, highlight people’s feedback. Old-fashioned marketing strategies would opt to advertise positive responses. However, people would want to see the other side of the coin: negative reviews. There is no perfect product so it’s impossible to evade negative labels from buyers. After all, there is no “one size fits all” brand. Given this reality, it would be better if you admit the flaws of your product or service and make up for it. Addressing negative feedback does more than elevating your ratings; it makes your customers feel that you are genuine as a seller and that you value customer service. SDI states that 30 percent of customers will return to a brand to see if there were any improvements made regarding their negative feedback. According to The Retailer Consumer Report, 68 percent of consumers who posted a negative review on a social networking site (after an unpleasant holiday shopping experience) got a response from their corresponding retailers. Unexpectedly, 18 percent of these buyers were converted into loyal customers and bought more than they previously purchased. User-generated content is a huge game changer in the field of marketing and advertising as it is the driving force that channels the attention of buyers and potential customers to your business. Therefore, it is important to create campaigns that does not only engage people, but also encourages them to spread the word about your brand. MacKinnon, Katherine A. “User Generated content vs. Advertising: Do Consumers Trust the Word of Others Over Advertisers?.” 2012. Pemberton, Chris. “Fuel Social Marketing with User Generated Content.” Gartner. June 10, 2016. Rick Enrico is the CEO and Founder of SlideGenius, a global presentation design agency. He regularly publishes expert presentation tips on the SlideGenius Blog. He currently oversees an experienced team of designers, software developers, and marketing professionals that specialize in creating custom corporate presentations and cloud publishing applications. Connect with him on LinkedIn and Twitter.